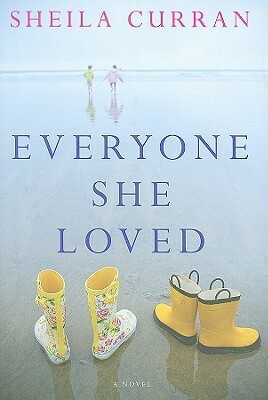 I finally finished reading Everyone She Loved by Sheila Curran. A wise and triumphant novel about four women who've come of age together only to discover that -- when it comes to the essentials -- life's little instruction book will always need revising. Penelope Cameron, loving mother, devoted wife and generous philanthropist, has convinced her husband and four closest friends to sign an outlandish pact. If Penelope should die before her two daughters are eighteen, her husband will not remarry without the permission of Penelope's sister and three college roommates. For years, this contract gathers dust until the unthinkable happens. Suddenly, everyone she loved must find their way in a world without Penelope. For Lucy Vargas, Penelope's best friend, and a second mother to her daughters, nothing seems more natural than to welcome them into a home that had once belonged to their family, a lovely, sprawling bed-and-breakfast on the beach. This bequest was only one of the many ways in which Penelope had supported Lucy's career as a painter, declaring her talent too important to squander. But now, in the wake of a disaster that only lovable, worrisome Penelope could have predicted, Lucy has put her work on hold as she and Penelope's husband, Joey, blindly grasp at anything that will keep the girls from sinking under the weight of their grief. With the help of family and friends, the children slowly build new lives. But just when things start to come together, the fragile serenity they have gained is suddenly threatened from within, and the unbreakable bonds they share seem likely to dissolve after all. In this entertaining and uplifting novel, Sheila Curran explores the faith one woman placed in her dearest friends, the care she took to protect her family and the many ways in which romantic entanglements will confound and confuse even the most determined of planners. A story about growing up and moving on, about the sacrifices people make for one another and the timeless legacy of love, "Everyone She Loved" is, above all, about the abiding strength of friendship. There are some books that I read a chapter here and a chapter there and take me forever to read. This was one of those books. I never got into it. At all. But I make myself finish every book I start, so here I am. There were too many sub-plots. Way too many. Death and cheating and lesbianism and obesity and anorexia and bulimia. Add it crazy characters, none of which I liked, and it didn't make for such a great read. Okay, I take that back. I kinda liked the two kids although its really more that I felt sorry for them than anything else. I gave this book a 2/5 rating. *FTC Disclosure: I received this book for free from the author in return for an honest review.